Mexican-American Duo Jesse & Joy Advocate For Migrants In The U.S.
Jesse and Joy Huerta, who make up the Mexican pop duo Jesse & Joy, are considering making English-language albums, and have become vocal advocates for Mexican migrants in the U.S.
Jesse and Joy Huerta of the sibling duo Jesse & Joy have been staples in Latin American pop circles for more than a decade. Jesse, with his trademark wide-brim fedoras and tattoos, plays guitar and piano. Joy brings the melodies and harmonic high notes. While long-embracing their bicultural heritage, current tensions between the U.S. and Mexico over immigration have compelled the duo to plunge into the debate over migrant families. In making the video for the title track of the pair's Grammy Award-winning album Un Besito Más, Jesse says he and his sister dove deep into the plight of separated families. The song's official video spotlights the struggle of a mother and father facing deportation and their decision to leave their U.S.-born daughter behind. Jesse says speaking both languages and holding two passports gives them a unique place to speak out for those not as privileged. "Why are we so lucky and blessed enough that we can travel back and forth without exposing our lives?" he asks. "That just made us commit more to it." Joy hopes their music can change hearts and minds. "I think it's a matter of respect, and if we give people information enough just to respect one another, I think we can help," she says. The duo's musical success has helped cement them as binational, bilingual advocates, a role Joy tearfully embraced during her acceptance speech at last year's Grammy Awards. "We are so proud to be Mexican-Americans, so this goes to all the Hispanics out there in this country," Jesse said in the speech. "To every minority group: We are with you. We stand with you." Though the pair has made a wholesome foray into reggaeton — their remixed single "3 A.M." with Cuba's reggaeton duo Gente de Zona is a hit among fans — Jesse & Joy sometimes strike a chord reminiscent of 1970s brother-and-sister pop icons Donny and Marie Osmond. That simplicity, often an outlier in today's music scene, is what 22-year-old fan Carla Hernandez Pedraza likes about Jesse & Joy. "I love the way they are," Pedraza says in Spanish. "They are just really down to Earth, lovely people." Church factored big in the roots of Jesse and Joy. They learned music by borrowing instruments from their father's evangelical church. And while they started off writing and singing in Spanish, both languages got equal play in their recent hometown concert in Mexico City. Their father is Mexican, their mother is from Wisconsin, and Joy says she had strict rules: "No Spanglish at home. She's like, 'No, no, no, just stick to one language.' I guess she wanted us to really get both languages separately." Moving into English language albums would seem like a natural next step for the duo, but like many of their fellow Latin American artists, it's a tough calculation. "We want to, but we don't want to lose our crowd, you know, our fan base" Joy says. "We don't want them to hate us here," Jesse adds. While they haven't committed to all-English just yet, Jesse & Joy released several English cuts, including the melodic "Echoes of Love." But Jesse & Joy shouldn't worry about being labeled a sell-out act. Eighteen-year-old fan Fatima Garcia traveled six hours by bus to get to the Mexico City concert. She says she loves the positive image Jesse & Joy reflect of Mexico and Mexicans these days, especially in the U.S.
"We are all just so proud of them," Garcia says. We're going to hear now from some of Latin America's top pop stars. They are a brother-and-sister duo from Mexico. They have racked up a lot of awards, and they just wrapped up a world tour. While long embracing their bicultural heritage, current tensions between the United States and Mexico over migration have plunged this duo into the thick of a debate over migrant families. NPR's Carrie Kahn spoke to the siblings Jesse & Joy at the end of their tour in Mexico City. JESSE AND JOY: (Singing in Spanish). CARRIE KAHN, BYLINE: Jesse and Joy Huerta, both in their 30s, have been a staple in Latin American pop circles for more than a decade. Jesse, with his trademark wide-brimmed fedoras and tattoos, plays guitar and piano. Joy brings the melodies and harmonic high notes. KAHN: Over the last 10 years, they've racked up plenty of awards, winning their first Grammy last year for Best Latin Pop Album, "Un Besito Mas." KAHN: The song's official video, with 3 million views looks, at the struggle of a mother and father facing deportation and their decision to leave their U.S.-born daughter behind. While making the video, Jesse says he and his sister dove deep into the plight of separated families. Talking at a popular restaurant near downtown Mexico City, Jesse says speaking both languages and holding two passports gives them a unique place to speak out for those not as privileged. JESSE HUERTA: Why are we so lucky and blessed enough that we can travel back and forth without exposing our lives and this and that? And that just made us commit more to it. KAHN: Joy says hopefully their music can change hearts and minds. JOY HUERTA: I think it's a matter of respect. And if we give people information enough just to respect one another, I think we can help. KAHN: Their music success has helped cement them as binational, bilingual advocates, a role Joy tearfully embraced in last year's Grammy acceptance speech. JOY HUERTA: This goes to all the Hispanics out there in this country, to every minority group - we are with you. We stand with you. KAHN: Their advocacy gets special play at their concerts, like during this recent wrap-up of their world tour in Mexico City. KAHN: But many fans say they came for the hits, especially their recent updated single with Cuba's reggaeton duo Gente de Zona. GENTE DE ZONA: (Singing in Spanish). KAHN: The siblings' dive into reggaeton is quite the wholesome foray into the genre better known for scantily-clad dancers and profane lyrics. In fact, the duo sometimes strikes a reminiscent chord of 1970s brother-and-sister pop icons Donny and Marie Osmond. That simplicity, though an outlier in today's music scene, is what draws 22-year-old fan Carla Hernandez Pedraza to Jesse & Joy. CARLA HERNANDEZ PEDRAZA: (Speaking Spanish). KAHN: "I love the way they are," says Hernandez. "They're just really down to earth, lovely people," she adds. Church factored big in the roots of Jesse & Joy, borrowing instruments from their father's evangelical church band helped them learn music. And while they started off writing and singing in Spanish, both languages got equal play in their Mexico City home. Dad is Mexican. Mom is from Wisconsin. And Joy says she had strict rules. JOY HUERTA: No Spanglish at home. She's like, no, no, no, just stick to one language. I guess she wanted us to really get both languages separately. KAHN: You would think moving into English-language albums would be natural for the perfectly bilingual duo now, But like many of their fellow Latin American artists, it's a tough calculation. JOY HUERTA: We want to, but we just don't want to lose our crowd, you know, our fanbase. JESSE HUERTA: We don't want them to hate us here. JOY HUERTA: We don't want them to think that we're, you know, like you're selling yourself. No. It just - we wanted it to feel natural. KAHN: While they haven't committed to all English quite yet, Jesse & Joy have released several cuts, like the melodic "Echoes Of Love." JESSE AND JOY: (Singing) Nothing left to say now. Every word is warm now. You and I are almost gone, fading like a broken song. And if I really listen, I hear you in the distance. Baby, all we got left of us are echoes of love. KAHN: Talking to fans at their recent Mexico City concert, Jesse & Joy shouldn't worry about being labeled sellouts. KAHN: "We're all just so proud of them," says 18-year-old Fatima Garcia, who traveled six hours by bus to get the concert. 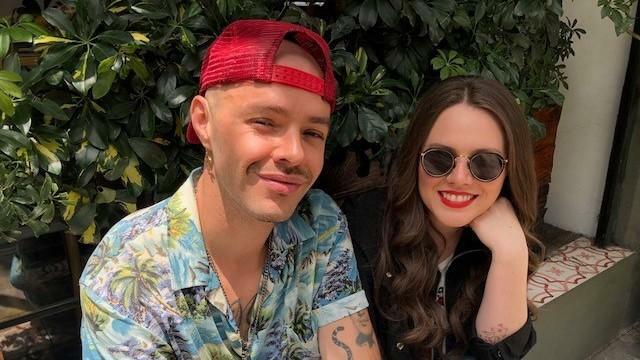 She says she loves the positive image they reflect of Mexico and Mexicans these days, especially in the U.S. Jesse & Joy are set to play in Los Angeles this coming August. Carrie Kahn, NPR News, Mexico City. JESSE AND JOY: (Singing) Nothing left to say now. Every word is worn out. Transcript provided by NPR, Copyright NPR.